Fighter's History was probably the most blatant rip-off of Street Fighter 2 in history (hence the title). Lo and behold, Data East had the audacity to make a sequel a year after the release of the original, even after Capcom tried to sue them for ripping off SF2. Fighter's History Dynamite (also known as Karnov's Revenge) is at least an improvement over the original. The sequel adds playable bosses (Clown and Karnov) and two new characters: Zazie & Yungmie. Besides a better selection of playable characters and some new backgrounds, the game itself really hasn't changed very much in terms of looks or gameplay. While playing Karnov's Revenge, there's just no way to shake the feeling that this game is trying to be Street Fighter 2 with a different cast of characters. For the second time around, it doesn't offer any true innovation to the fighting game genre. Although, you could unlock a special fight against a bull if you beat the game without losing a single round, but who the hell would want to play this game for that long? 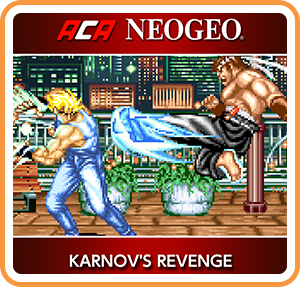 Where can I buy ACA NEOGEO KARNOV'S REVENGE physical/digital?